JNTUK Kakinada : Procedure To Apply For Recounting / Revaluation / Challenge Valuation (Online Process). Those Students Who Need To Apply For Recounting / Revaluation / Challenge Valuation Can Apply Through The State Bank Collect Portal. News On 10.08.2016 (Wednesday) : All The Principals Of Affiliated Colleges Of JNTUK, Kakinada Are Here By Informed That Hence Forth The Students Have To Apply Directly For Recounting / Revaluation / Challenge Valuation (PG / UG Courses) Through Online Only. The Application Fee For Revaluation Of Each Answer Script Is Rs. 1000.00/- & Recounting Of Each Answer Script Is Rs. 100.00/- . The Fee Amount Is To Be Paid Either By Making Online Payment (Using Master / Visa Credit / Debit (ATM) Cards) (Or) By Making The Payment At Any Branch Of SBI Using The Online Challan Generated By This Online Payment Application. Choose The Below Link For Revaluation / Recounting / Challenge Valuation Of Answer Scripts. Select Revaluation, Recounting (Or) Challenge Valuation Fee From The Payment Categories. Provide The Details Of The Candidate Applying For Revaluation / Recounting / Challenge Valuation (Hall Ticket Number, Name, Course, Year, Semester, Subject Code, Subject Name, Contact Number & E.T.C.,) Carefully & Click On Submit. Check The Details Provided Carefully & Confirm. Select The Payment Options Among Net Banking, Debit / Credit Cards, SBI Branch Challan Payment & Make The Necessary Payment Before The Last Date For The Revaluation / Recounting. The Transactions Made After The Last Date Will Not Be Considered & Will Not Be Refunded. Take A Printout Of Payment Details & Preserve For Further Reference. The Candidate Can Take Printout Of E Receipt Of State Bank Collect Payment At Any Time By Providing Information Like Contact Number, Date Of Birth, Date Of Payment, E.T.C., In The State Bank Collect Page. Each Time The Student Can Apply For Revaluation / Recounting For Only One Subject. If The Student Wants To Apply For More Subjects, He / She Has To Apply For Each Subject Separately. 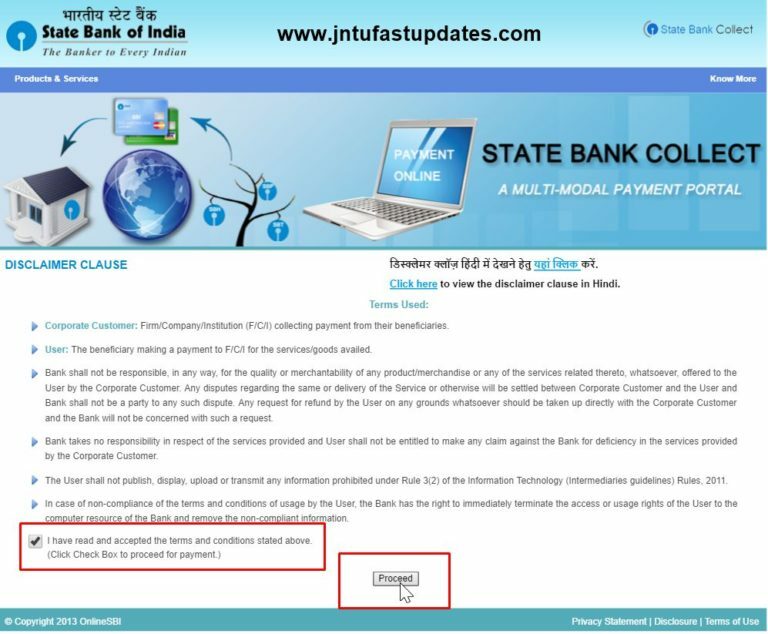 2) Check The Box : "I Have Read And Accepted The Terms And Conditions Stated Above" & Click "Proceed" Button. 6) Now Enter Your Hall Ticket Number, Subject Code & Click Submit. Students Are Informed To Be More Careful In Furnishing The Information Online While Applying For Recounting / Revaluation / Challenge Valuation. The Applications With Insufficient / Wrong Information Will Be Summarily Rejected & The Candidate Has To Forfeit The Amount Paid In This Connection. Students Should Apply For Recounting / Revaluation / Challenge Valuation Through Online Only. No Recounting / Revaluation / Challenge Valuation For Lab Marks. 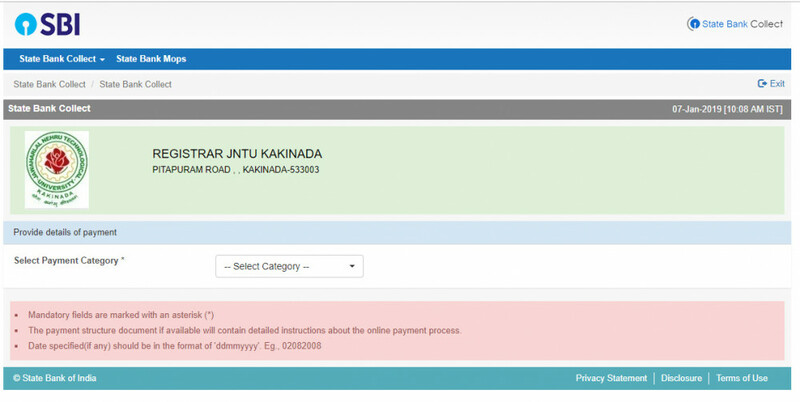 So, Above You Can Get The Instructions For The JNTUK Kakinada : Procedure To Apply For Recounting / Revaluation / Challenge Valuation (Online Process). You Can Simply Bookmark This Page As Well In Order To Check All The Instructions For The JNTUK Kakinada : Procedure To Apply For Recounting / Revaluation / Challenge Valuation (Online Process) In The Future As Well. So Do Book Mark Our INJNTU.COM Page & Install Our Android App To Get All Notifications About Updates & Results Directly On Your Mobile Phone. Don’t Forget To Share This Info About Instructions (Or) Process Of How To Apply JNTUK Kakinada : Procedure To Apply For Recounting / Revaluation / Challenge Valuation (Online Process) Among All Your Friends & Colleagues. Make Them Know More About The Process Of How To Apply JNTUK Kakinada : Procedure To Apply For Recounting / Revaluation / Challenge Valuation (Online Process). Also Share This Info On Your Social Media Pages.